Robert Ashton was born in Strubby, Lincs in about 1869. In Nov 1886 (aged about 18) he was working as a waggoner at Midvillle (North of Boston) when, with 8 others, he was fined for drunkenness at Stickney Village Feast. The village pubs had been given an extension for the Feast and things seem to have got out of hand. One of the lads tried to push over a shooting gallery while the proprietor hid in his van. In 1893 Robert married Eliza Anne Maidens and they went on to have many children. He worked as a yardman (ie with cattle) and seemed to move between farms, living in Brandon, West Willoughby and Londonthorpe. They were at Belton Ashes when Eliza Anne died in 1908. The following year Robert married her younger sister Rachel and went on to have several more children (until 1907 it was illegal for a man to marry his dead wife’s sister. Marriage to a brother’s widow wasn’t legalised until 1921). By 1911 Robert and Rachel were living in Brandon (possibly at Grange Cottages) where Robert was a farm foreman. They later seem to have moved back to East Lincolnshire before settling in Fulbeck, perhaps around 1920. Children of the second marriage included Cecil (born 1919 Horncastle area) and Eric James (born 1921, possibly Fulbeck area). On D Day (6th June 1944) Cecil and Robert were both serving with 26 Assault Squadron, Royal Engineers. They landed on Juno beach (Courseulles) with the leading units of 3rd Canadian Division. Their job was to knock out pill boxes, gun emplacements and walls and clear a way off the beach. 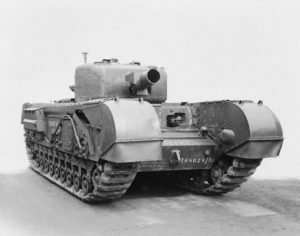 They operated modified Churchill tanks called AVREs (Assault Vehicles Royal Engineer) fitted with a Petard spigot mortar, a short range weapon which fired a 40lb ‘flying dustbin’ up to 80 yards. 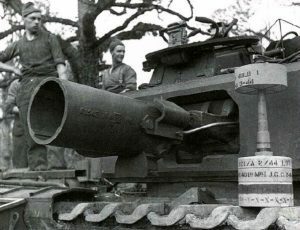 The mortar was reloaded from a hatch in the hull of the tank. The AVRE had a crew of 6, with a driver from the Royal Tank Regiment and the others being engineers. Cecil worked as a gardener for Col W V R King Fane in Fulbeck, before joining the Army in 1936. He married Joyce Ferris in 1941. She lived in Park Avenue, Highworth, Wiltshire. They had a son in 1942 but he died the following year. Their daughter Wendy was born in 1944, a week before he left for Normandy. L/Sgt Cecil Ashton was commanding an AVRE when he was killed on D-Day. It appears that his tank was callsign 1C which was carrying a fascine on the front (a bundle of wooden poles/brushwood lashed together). The Germans had blocked the beach exit by blowing up a culvert. AVRE 1C was sent forward to drop the fascine into the crater but the tank slipped into the crater and began to fill with water. The crew scrambled out but were hit by mortar fire before they could get back to the dunes. Three were killed on the beach and another died later; the two survivors were badly injured. Cecil Ashton (age 26) and 2 others were buried at Graye sur Mer (Mike sector of Juno Beach). They were reburied in Bayeux War Cemetery in December 1944. Their tank was now blocking the exit, so the engineers pushed it further into the crater and dropped an assault bridge from the beach onto the turret of the AVRE. They then dropped more fascines the other side and reinforced the makeshift causeway with rubble. 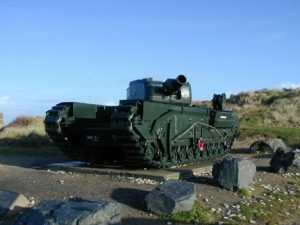 By mid morning tanks and infantry were able to use this to cross the crater and break out from Juno beach. The causeway was later reinforced with concrete and the abandoned AVRE was forgotten about. Many years later 1C was rescued from the hole, restored and put on display on the beach. Eric worked as a gardener for Capt J S Reeves of Leadenhall before he too joined the Army in 1937. Cpl Eric Ashton died on 17th June (11 days after his brother) and was buried (again with 2 comrades) at Beny sur Mer (about 3 miles inland from Juno Beach). He was reburied at Bayeux War Cemetery in Nov 1944.